Get the Chase Sapphire Preferred® Card if you want the option of turning points into real airline miles and hotel points, plus great trip delay and cancellation coverage. If you travel more than a couple times a year it’s a great choice. Consider the Bank of America® Travel Rewards credit card if you want a $0 annual fee card and a decent earning with no foreign transaction fees, but you don’t want to earn real airline miles or hotel points. If you’re a Bank of America Preferred Rewards member, you can also earn up to nearly 3 points per dollar on all purchases, though we wouldn’t go out of our way to become a Preferred Rewards level member if you aren’t one already. 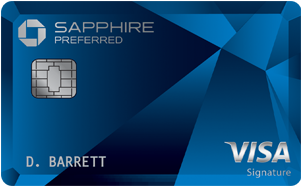 Chase Sapphire Preferred® Card: The card earns 2X points on travel and dining at restaurants & 1 point per dollar spent on all other purchases worldwide, and earns Ultimate Rewards® points that you can use to buy travel on most airlines, or transfer into real airline miles with 6 airlines, including United and Southwest. You can also turn them into real hotel points with 3 hotel chains, including Hyatt and Marriott. It has a $95 annual fee. 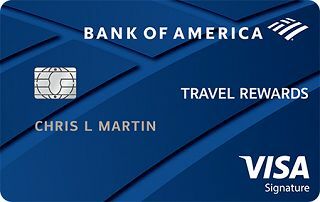 Bank of America® Travel Rewards credit card: The card earns Earn 1.5 points per $1 spent on all purchases, has a $0 annual fee, and the points let you cover the cost of any travel you purchase with your card. Preferred Rewards members earn up to nearly 3 points per dollar on all spending. 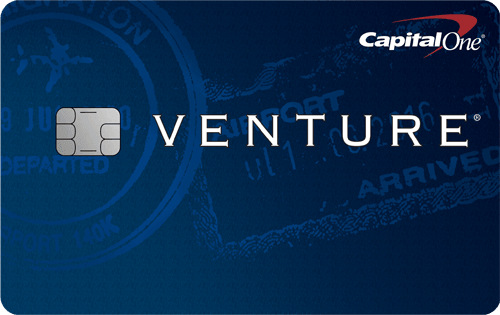 Both cards have no foreign transaction fees and have an EMV chip built in with signature priority. And here are more specifics on each card with the pros and cons so you can compare. Turn points into real airline miles. The Chase Sapphire Preferred® Card lets you transfer your points any time into United miles, Southwest points, or even British Airways, Singapore Airlines, Virgin Atlantic, or Korean Airlines miles for all kinds of options that can get you the kinds of trips you never thought possible. This is the most powerful feature of the card and if you already have some United or Southwest miles you’ll get more bang from your spending because you can add to the miles you already have. Yes it can be a pain to deal with real airline miles sometimes, but this card gives you the best of both worlds. You also have the option of using your points to pay for flights and hotels via the Chase Ultimate Rewards website, at prices like those you’ll find on regular travel sites like Expedia or Orbitz. So you’ll always have a way to get good value from your points. Whenever you buy a plane ticket with your card, you’ll be covered for up to $500 in hotel, meal, and transportation expenses if your flight is delayed 12 hours or more. So you don’t have to think about whether the airline will take care of you. Just file a claim when you get back and you can be reimbursed. If you get very sick or badly injured and that keeps you from traveling on a trip you buy with the card, you can get the nonrefundable part reimbursed, up to $5,000 per person. That’s similar to standalone travel insurance that often costs $50 or more per trip, and even big purchases like cruises can be covered. There are no ‘gotcha’ countries where you won’t be covered for car rental damage. You can rent in any country in the world and be covered for collision damage when you book and pay for the rental with your card. There is an annual fee of $95, which you’ll have to weigh. If you spend $2,000 or more a month, or can take advantage of the airline mile transfer option it’s probably worth your while. You only earn 1 point per dollar on most spending, compared to 1.5 points per dollar with the Bank of America® Travel Rewards credit card, but you get a lot more flexibility with points from the Chase Sapphire Preferred® Card, since you can turn them into real airline miles and hotel points to get even more value. If you don’t want to turn your points into real airline miles, you’ll need to book travel via the Chase Ultimate Rewards website to use your points. It’s not terrible – you’ll find most airlines and usually find the lowest fares, but it’s not as easy as simply paying for a flight with your card and using points to get it reimbursed. Faster earning on base spending. 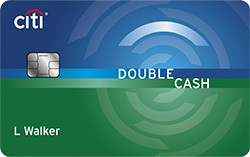 Earn 1.5 points per $1 spent on all purchases adds up fast with a $0 annual fee card. If you hate annual fees, it’s hard to find a better card for travel rewards than this one. But not having an annual fee means you give up privileges like the ability to turn points into real airline miles. Just charge any travel purchase to your card, then use your points to erase some or all of it from your statement. Every 10,000 points is worth $100 and you can redeem as few as 2,500 points at a time ($25 worth). If you have a Bank of America account you can get an additional 10% bonus on your points each year. And if you are a Preferred Rewards level member with high balances in Bank of America accounts you can get a 25% – 75% bonus which can make the Bank of America® Travel Rewards credit card very lucrative with over 2 points per dollar on everything you spend. If you buy travel via the Bank of America Travel Center you get another 1.5 points per dollar you spend, getting you at least 3 points per dollar. The catch is the Bank of America Travel Center is clunky to use and doesn’t always offer the lowest fares. You can’t mix and match these points with any airline miles or hotel points you already have, so you won’t be able to get the outsized value you can sometimes get when using real airline miles or hotel points, especially for big international or luxury trips. The Bank of America® Travel Rewards credit card card every 1o,000 points is worth $100 (1 cent per point). If you have some United miles or Southwest points you’re best off considering the Chase Sapphire Preferred® Card so you can add to the points you already have. And if you want to get good deals on international or luxury travel, or even regular hotel stays, that only real airline miles and hotel points can get you, then go for the Chase Sapphire Preferred® Card. But if you just want dead simple rewards with no annual fee, but giving up some of the dream trip options, then the Bank of America® Travel Rewards credit card is a decent choice. (933) Over the Past 60 Days! Though given no fee on the Bank of America® Travel Rewards credit card, if you’re willing to apply for another card there’s little harm in having it on hand regardless of what other cards you choose.